China has introduced a three-year action plan to upgrade the manufacturing sectors. These include new materials, shipbuilding and railroad vehicles to keep up with other rivals in the world, the country's top economic planner announced Monday. The National Development and Reform Commission has presented a three-year action plan (2018-2020) for the manufacturing industry. This will stimulate growth in key industries, including high-speed trains, advanced ships, offshore equipment, industrial robots, new-energy vehicles, new materials, biomedicine and medical devices. The country plans to achieve industrial production breakthroughs in key technological areas in major manufacturing industries by 2020. The National Commission for Development and Reform said in a statement on the website. The country wants to support and cultivate the leading companies and famous brands. By 2020, they also want to support internationally recognized industry standards in these sectors, as the plan implies. Sun Fuquan, a researcher with the Beijing-based Chinese Academy of Science and Technology, said China is a bigger competitor in the manufacturing industry. China has 110 companies in the "Fortune 500" list. These companies are mainly in the banking and insurance, infrastructure, real estate and energy sectors. But their main area of influence is mainly in the home market. In the railway equipment sector, the country plans to develop its own maglev trains at speeds of up to 600 kilometers per hour over the next three years, automatic high-speed train signaling systems and freight trains operating at 160 kilometers per hour. In key marine transportation, resource development and national defense areas, China will place extra value on developing high-quality ships and offshore construction products. These include police ships, oversized container ships, ships for polar expeditions and semi-submersible installations for offshore oil and gas drilling. By 2020, the country will be able to develop robots with autonomous programming as well as human-machine collaborations and two-arm collaboration robots. Color spray and cleaning robots are said to be used in the automotive, metalworking and medical and chemical sectors. "The country needs to ensure that current massive investments in technology such as the Internet, robotics and virtual reality are developing to the benefit of their respective industries. 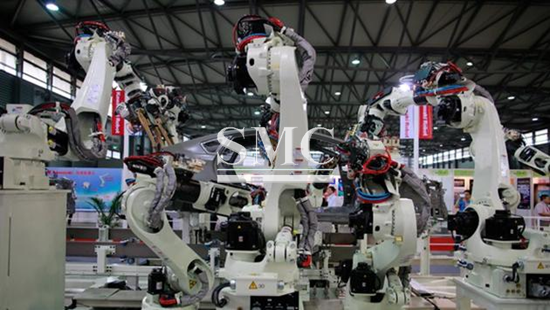 These industries will be linked to scientists, engineers and entrepreneurs, bringing the top talent closer to the factories, "said Shi Yong, vice president of the Beijing-based China Machinery Industry Information Research Institute.